A well-designed, do-it-all controller keyboard that delivers that extra dash of Roland quality. Impressive look and feel. Control maps for DAWs supplied. Pads more useful than a crossfader. Genuinely useful software bundle. Higher price than many rivals. Dynamic mapping only usable with Sonar. 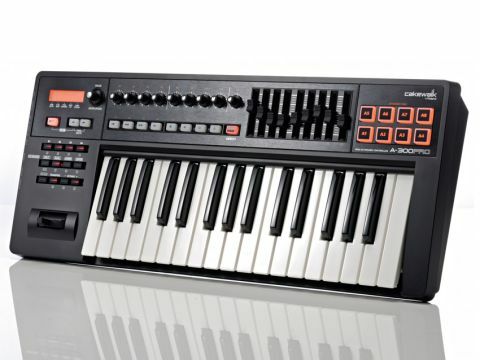 Cakewalk's (and, by extension, Roland's) A-300 Pro is one of the most synth-esque, performance-orientated offerings we've seen of late - you wouldn't be embarrassed to take it on stage with you. For extra cachet, it's a shame it doesn't have the Roland logo on the back, but this badge of honour is reserved for the company's sound-filled keyboards. As with the majority of keyboards from the Roland family, this one is smooth and playable (you can choose from a selection of velocity curves), making it particularly suited to synth work. Other than the number of keys, all three models share the same specs: you get 45 assignable controls, which include banks of buttons, knobs and faders. You also get eight Dynamic Pads - these light-up when they're hit and are velocity-sensitive. They're just about large and well-spaced enough for drumming with your fingers (loop triggering is another possible application), though we did find that the velocity response is slightly unpredictable unless you hit the pads slap-bang in the middle. Turning to the other controls, the nine knobs feel smooth and firm enough, and although the nine faders don't have masses of travel, they're fine too. Unlike the Edirol PCR-300, the controller that the A-300 Pro effectively replaces, there's no crossfader. This seems to have been omitted to allow the inclusion of the pads, which seems like a fair swap to us. Other noteworthy features include a bright, backlit LCD display and left-side-mounted USB, MIDI I/O, and Hold and Expression pedal connections. We prefer this to having them on the back, making it easier to put a QWERTY keyboard behind the A-300, though it could be undesirable if you prefer to place your MIDI keyboard alongside your QWERTY one. Unless you're a Sonar user, the A-300 Pro doesn't have any fancy auto-mapping features built in, though it does come with a selection of control maps that cover all the major DAWs. Manual assignments and custom control maps can be made in the supplied A-Pro Editor software, which works as expected. Cakewalk describe the Production Plus Pack, which ships with the A-300 Pro, as "the most powerful suite of OEM music creation software available today". The centrepiece is Sonar 8.5 LE, a cut-down version of the latest iteration of Cakewalk's DAW. Its feature set includes support for Cakewalk's Active Controller Technology (ACT), which means the most relevant parameters are automatically mapped to the A-300 Pro as you move around its mixer, instruments and effects. There are also three instruments: Rapture LE (a pared-down edition of Cakewalk's classy wavetable synth); Cakewalk Sound Center (a general purpose sound module); and Studio Instruments Drums (a simple acoustic drum module). The bundle is undoubtedly a great entry point into the world of computer-based music-making, and certainly does more to justify the A 300 Pro's price tag. The A-300 Pro is a reassuringly simple all-in-one controller that will perfectly suit many producers. It's a touch more expensive than some of its rivals, but its superior build quality and styling make it a solid investment.